Years of research and client experience have convinced us – and our clients – that while the “usual suspects” of ROI and TCO have their place, they don’t go far enough when it comes to determining how truly meaningful a smart systems decision can be to your organization’s success – and they don’t lead anywhere in terms of helping you treat information as an asset. Overcoming these shortcomings is what our Methodology for Deriving Maximum Total Value® (MAXTV®) is all about. 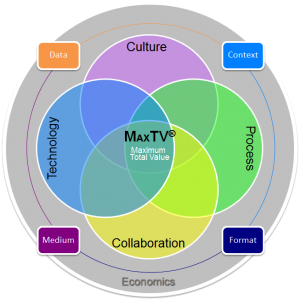 We use the graphic at right to illustrate the MAXTV® framework, and we use it to inform everything we do, from organizational maturity modeling to program planning to vendor evaluation and selection. This universality sets us apart from other firms in that we apply a consistent and comprehensive structure to your thorniest issues. Piecemeal perspectives may be all right for others, but not for us – and certainly not for our clients! Contact us today to learn more about how this all works, and how you can start taking immediate advantage!